Calling it an 'on-ramp to the Internet,' Mark Zuckerberg advocates for carriers and other gatekeepers to provide free basic services for all in his first-ever keynote at Mobile World Congress. Facebook CEO Mark Zuckerberg's keynote at Mobile World Congress fittingly began and ended with the topic fresh on everyone's minds: the company's $19 billion acquisition of WhatsApp. In calling it "the most engaging app that we've ever seen exist on mobile so far," Zuckerberg says the deal didn't come together until he and WhatsApp's co-founder and CEO Jan Koum talked about their shared vision for connecting every person to the Internet. "It's easy to take for granted that most people in the world don't have access to the Internet at all," he says. "We're not really on a path to connect everyone unless something pretty dramatic changes." 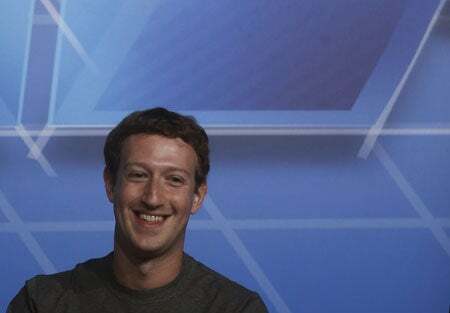 Facebook CEO Mark Zuckerberg smiles before delivering a keynote speech during the Mobile World Congress in Barcelona yesterday. Photo: REUTERS/Albert Gea. Facebook and its partners in the Internet.org alliance are committed to the simple vision that "some day someone should try and help connect everyone in the world," he says, but Zuckerberg is also quick to add that "we're probably going to lose money on this for quite a while." As much as 80 percent of the world's population already live in an area where 2G or 3G wireless access is available, he says. "The most expensive part about owning a smartphone and being connected to the Internet isn't the smartphone, it's the data connection." While cost is a major impediment to more widespread Internet adoption, Facebook and its partners face an even bigger task in convincing potential users why they should pay for access in the first place. Connectivity in and of itself is not the goal, but rather a means to an end, Zuckerberg says. He calls upon numerous studies that suggest access to upward mobility, higher education, improved health and other positive outcomes typically flow as a result of online access. "Look, after buying a company for $16 billion, you're probably done for a while." Zuckerberg says Internet.org wants to create a "dial tone for the Internet," comparing the basic level of free service he envisions to 9-1-1 emergency services in the United States. "There's a set of basic service that we think should exist, whether it's messaging, or being able to know what the weather is. These are just basic services that people should be able to access," he adds. "They're all text-based, incredibly low-bandwidth and cheap to serve." He calls it the "on-ramp to the Internet," and advocates for deep involvement from carriers, developers, providers, nongovernmental organizations and all others that have a vested interest in greater connectivity around the globe. Gaining favor from wireless carriers and network access providers that hold the keys to connectivity could prove to be the biggest challenge for Internet.org's backers. While carriers will decide what basic services are and what they want to include for free, the road to get to that point involves them charging less for data but also paying less to deliver services that require that data. For now, Internet.org is focused on proving that the model works through ongoing efforts with a small number of carrier partners, according to Zuckerberg. The alliance is drilling into three key areas that should lower the bar for access across the board: decreasing the cost of infrastructure required to deliver the Internet, decreasing the amount of data used online and increasing the opportunity to sell subscriptions and compel users to pay for other data features. Facebook is already doing its part to cut back on the massive amounts of data it requires of the Internet every day. While the average Facebook user used 14 MB of data a day this time last year, the company's engineers have since whittled that down to an average of 2 MB per day and Zuckerberg says it plans to get that further down to 1 MB soon. The guiding principle or framework to Internet.org to succeed is that early access to the Internet, even a stripped down version of it, will beget a voracious appetite for more. The billions of people who don't have access today are simply unaware of what they're missing out on. "The important thing is that it shows people why it is rational and good for them to spend the limited money they have on the Internet," says Zuckerberg. The "social network and search are portals to more content," Zuckerberg says, explaining why carriers should be eager to make free access to Facebook, Wikipedia and other services more widely available. "I cannot construct any model that's profitable in the near term," he adds. "If we do something that's good for the world, eventually we'll find a way to benefit at some point." Facebook and Internet.org don't have the resources to work with dozens of partners now, but Zuckerberg says the company is looking to match up with another handful of companies this year to expand the program and tweak the model for the long term. "What we want to trial over the next year is the full vision," he says, adding that carriers and Facebook can learn a great deal from using the data they collectively hold on customers. Closing out his keynote with questions from the audience, Zuckerberg was again asked to justify Facebook's latest acquisition and clarify plans for WhatsApp going ahead. He somewhat humbly offered the possibility that he could be wrong, but reiterated his belief that any service that reaches a billion people or is on path to do so is "incredibly valuable." WhatsApp's policies and services will remain unchanged under the umbrella of Facebook, he says. The 500 million photos delivered on WhatsApp every day are not stored by the company, and Zuckerberg says there are no plans to change that or capitalize on the data WhatsApp knows about its users like Facebook does today. In a parting shot of sorts, Zuckerberg was asked if Facebook plans to make another bid for Snapchat. "Nope," he says, interestingly enough without confirming or denying the recent reportedly spurned offer of $3 billion for Snapchat. "Look, after buying a company for $16 billion, you're probably done for a while," he says.